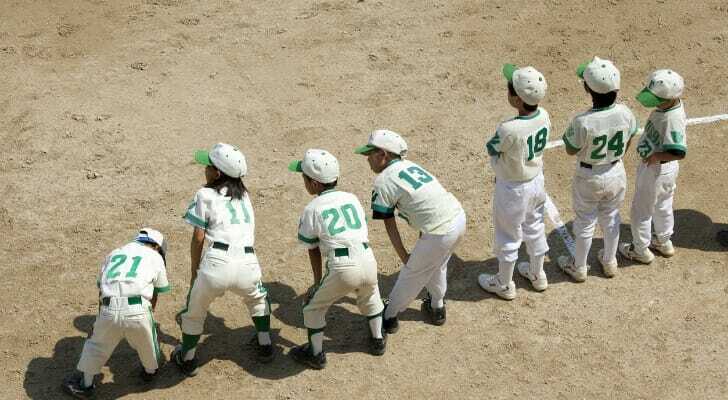 Minor league teams are a beloved tradition in many baseball towns across America. They offer fans many advantages that the major leagues can’t compete with. First off, minor league games are affordable, meaning attendees can keep more money in their savings accounts. Secondly, minor league games are mostly a local affair offering fans a more intimate, community experience. Below, with all that in mind, SmartAsset takes on the challenge of ranking the best minor league baseball towns in America. 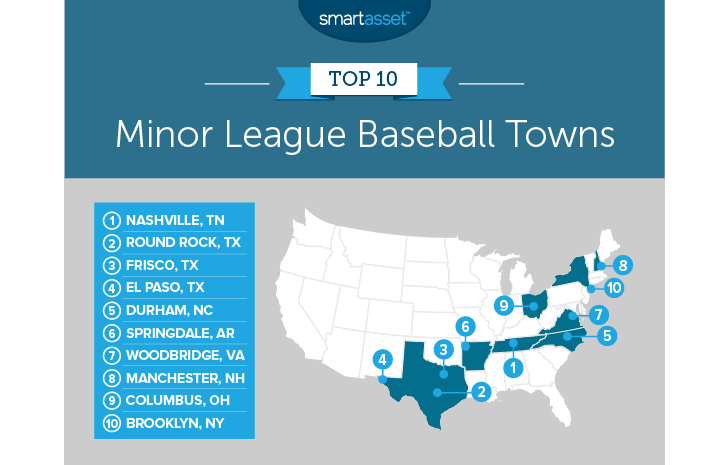 In order to rank the best minor league baseball towns in American, SmartAsset looked at data for nine factors. Specifically, we used these nine metrics to create two scores: game-day score and quality of life score. We used these two calculations to create our final ranking. Check out our data and methodology below to see where we got our data and how we put it together to create our final ranking. 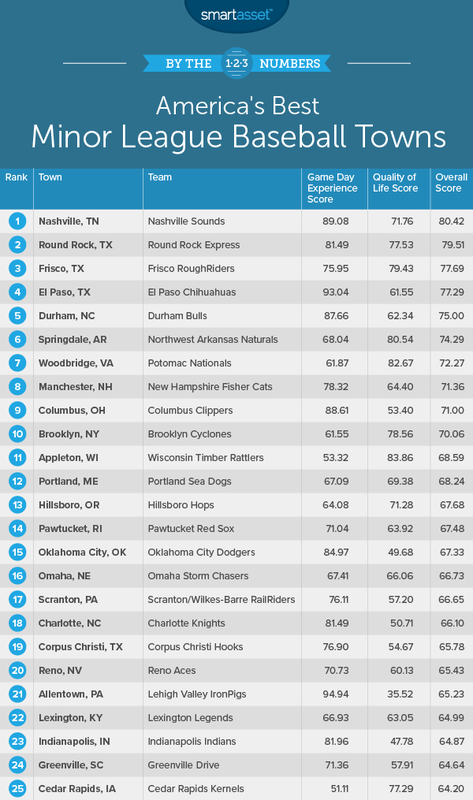 This is SmartAsset’s fifth annual ranking of America’s best minor league baseball towns. See the 2017 ranking here. Back-to-back champ – For the second straight year Nashville is the number one Baseball town in America. This city combines stellar play on the field with some of the best off-field quality of life in the study. Texas is the best state for minor league baseball – The Lone Star State has three cities included in the top-five baseball towns in America. The top scoring Texas town is Round Rock, which has consistently contended for the top spot in past years. Nashville took the top spot once again. Residents of Nashville love attending Sounds’ games. According to our data, the Nashville Sound is one of the teams whose games are most well-attended. Our research shows that the average Nashville Sounds game attracts nearly 8,700 people, filling roughly 87% of seats. This team also boasts a fairly good record and plays in Triple-A, meaning the quality of play on offer to fans is just one step below the major leagues. Round Rock continues to put up solid numbers, taking the runner-up spot for the second straight year. The Round Rock Express home games are actually better attended than the Nashville Sound games. However, the on-field product leaves a bit to be desired. This year the Express find themselves at the bottom of their division. Other than the Express, Round Rock is a great place to live. This city is relatively safe with top-35 scores in both violent and property crime rates. Many residents here are also able to afford housing with plenty of money left over to deposit in their checking accounts. This city ranks in the top 10 for income after housing. Riding into third place is Frisco. According to our data, Frisco is one of the best baseball towns to live in. Crime here is not very prevalent – Frisco ranks in the top-15 for both crime metrics – and many residents work in well-paying jobs. According to our data, the average household should have about $96,000 left over after paying for housing. The El Paso Chihuahuas are one of the strongest teams in this top 10. They currently sit atop their division, wowing their fans with a win percentage near 60%. All these victories have kept plenty of people in the stands. More than 7,700 fans pack into Chihuahua games to watch the Chihuahuas nibble away at their opponent’s playoff hopes. Overall El Paso ranks in the top 20 in all of our game-day experience metrics. That gives it the highest game-day score in the study. Durham, and their Bulls, leveraged on-field success to secure a top-five finish. This team averaged nearly 7,600 fans per game, filling more than 75% of the stadium. In both of those metrics Durham ranks in the top 35. This city also scores fairly well in other quality-of-life metrics. It has an unemployment rate of only 3.8% and median household income after factoring in housing costs ranks in the top 30. Coming in sixth is Springdale, Arkansas, home of the Northwest Arkansas Naturals. The Naturals are the Double-A affiliate of the Kansas City Royals with plenty of recent on-field success. This team is a constant contender for its division title and won the minor league title in 2010. Of course, there is nothing fans enjoy more than winning, so seeing the Naturals high attendance figures is no shock. While the Naturals’ success on the field led to a good game-day score, it is the quality of life in Springdale that secures the town’s top 10 spot. This city has the lowest property crime rate in the study and a top-10 unemployment rate, giving it a quality of life score of 80.54. Sometimes going to a baseball game is more about the atmosphere than seeing the best baseball product. Residents of Potomac Nationals can certainly attest to that. Their Potomac Nationals play in High Class A, the second-lowest league in our top 10. But fans still have a great time, filling nearly 69% of seats available at Nationals’ games. Woodbridge pads the stats in the quality of life metrics too. This city ranks in the top 20 for four out of our five quality of life metrics, giving it a quality of life score of 82.67. The Fisher Cats have in the past contended for a top 10 spot but have never been able to crack it, until now. Manchester took a top 10 spot thanks to a strong game-day score of 78.32. While the Fisher Cats don’t have any home run metrics they boast some great all-around scores. In every game-day metric, the Fisher Cats rank no worse than 38th. The quality of life score in the Fisher Cats’ hometown is able to close out a top 10 finish. In particular the unemployment rate here is very low. Manchester, New Hampshire has an unemployment rate of only 2.7%. Columbus, home to the Clippers, the Triple-A affiliate of the Cleveland Indians, takes ninth. The Clippers offer one of the most competitive gameday experiences according to our research. Just under 8,600 fans fill about 85% of seats at Clippers games on average. Percentage-wise, that makes it a better attended venue than Progressive Field, home of the Cleveland Indians. If Columbus wants to take a swing at the championship next year, it will need to improve its quality of life score. In that metric, Columbus only scored a 53. Coming in 10th are the Brooklyn Cyclones. Brooklyn has a long baseball history. Before the Dodgers decamped to Los Angeles, they played at Ebbets Field in Brooklyn, where they won multiple World Series titles. But now Brooklyn baseball fans have to content themselves with the slightly less glamorous Brooklyn Cyclones, who ply their trade in Class A Short. Despite the Cyclones’ relatively humble stature, Brooklynites spend many a summer evenings watching their Cyclones play ball. The Cyclones saw roughly 5,300 fans attend their games on average, equal to around 70% of max capacity. In both of those metrics, Brooklyn ranks in the top 45. Brooklyn primarily takes a top-10 spot not for its game-day experience but because of its quality of life. This place has a relatively high income after housing, and there are plenty of ways to spend your money other than at a Cyclones game. Dining and entertainment establishments make up 13% of all establishments in the city. Average attendance. This is the average number of fans who attended each game. Data comes from milb.com and is for the 2018 season. Average attendance as a percent of max capacity. Data on attendance for the 2018 season comes from milb.com and data on max capacity comes from www.baseballpilgrimages.com. Win percentage. Data comes from www.baseballamerica.com and is for the 2018 season. Violent crime rate. This is the number of violent crimes per 100,000 residents. Data comes from the 2016 and 2015 FBI Uniform Crime Reporting database. For cities where there was no data available, we used the average from all cities in the study. Property crime rate. This is the number of property crimes per 100,000 residents. Data comes from the 2016 and 2015 FBI Uniform Crime Reporting database. For cities where there was no data available we used the average from all cities in the study. Income after housing. This is median household income minus median housing costs. Data comes from the U.S. Census Bureau’s 2016 American Community Survey. Unemployment rate. Data comes from the BLS and is the unemployment rate from May 2017 to June 2018. Dining and entertainment establishments. This is the number of bars, restaurants and entertainment establishments as a percent of all establishments. Data comes from the Census Bureau’s Business Patterns Survey and is for 2016. First we ranked each city in each factor. We created separate indices for quality of life metrics and game day experience metrics assigning a score to each based upon their rankings in each category. All metrics received equal weighting, except property crime rate per 100,000 residents. We then averaged the two indexes to create our final score. We ranked the cities from highest to lowest based upon this score. Have a plan – What you save is the difference between what you earn and what you spend. That’s pretty obvious, but the people with the best plan will find they are able to maximize their savings the most. One example of this is an emergency fund. It is not obvious immediately why having an emergency fund is important but it is. An emergency fund can help you pay for unexpected costs a car repair or medical procedure. By paying for those costs with your emergency fund you save money. Without an emergency fund you may have had to sell long-term assets or take on expensive debt. Make you savings work for you – Don’t leave your money under your mattress. Instead put it in a high-yield savings account. To get the best APYs, check out the savings accounts at Ally or Synchrony. These online-only institutions offer some of the highest APRs on the market. Get an expert’s opinion – When it comes to your hard-earned savings, you want to get the best advice and knock it out of the park when making big decisions. Should you invest in stocks or bonds? Buy a home or save for retirement? There are tons of ways to use your savings but everyone has unique circumstances that call for different financial action. To find the best advice you should talk to a financial advisor. If you’re not sure where to find a financial advisor check out SmartAsset’s financial advisor matching tool. It will match you with up to three local financial advisors who fit your investing needs.